Everett Aviation uses the PRISM (Proactive Reactive Integrated Safety Management) software Quality & Safety Management tool to assist in the management of its SMS and Quality & Safety processes. Since its introduction, PRISM has revolutionised the way that Everett Aviation manages risk. In addition to meeting the many regulatory criteria for Quality & Safety management, PRISM automatically monitors the Company's potential risk and sends alerts to the Company post holders. By monitoring data 24/7, it searches out and identifies anomalies that could represent a potential risk, notifying the relevant person in the organisation. As a web-based application, it is accessible across the globe at the touch of a button, meaning all Everett staff have access to it, irrespective of their location. PRISM actively monitors and assesses the risk status for a location, unit or Company continually - 24 hours/day, 7 days/week. When the system identifies a rise or decline in the level of risk, all relevant staff automatically notified immediately by e-mail. PRISM's license is based on the number of aircraft operated (not the number of people using the software) and at implementation, Everett ensured that every member of staff was able to log onto & use the basic features of the system for hazard, incident & accident reporting and risk analysis. 3. 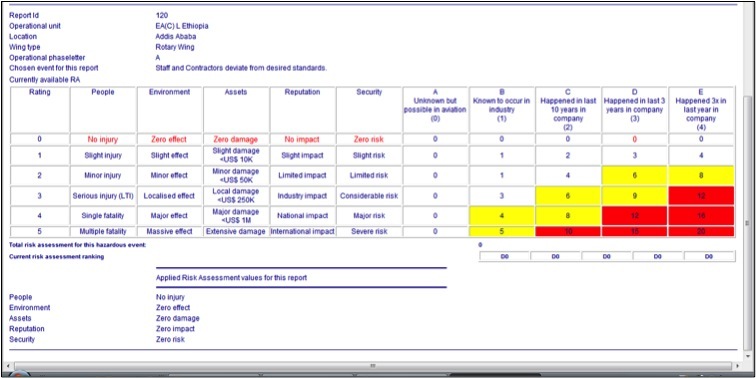 Risk assessment matrix and 'Risk Adjuster'. PRISM guides users through the risk assessment process for every event entered into the system. All the user has to do is enter the details of the occurrence and PRISM will take care of the rest. Based on an initial risk assessment, previous occurrences and the time span involved, PRISM will calculate present risk for a location, unit or the whole company. Everett's risk register is continually monitored 24 hours a day and in the event that any risk starts to rise in the Company, Managerial staff are immediately notified automatically. Every user in the system is identified by user name, password and e-mail address. In the event that a risk assessment is changed or an audit is amended or a corrective action request (CAR) initiated, relevant personnel are notified by e-mail. Should a CAR become overdue, an e-mail will alert the relevant personnel. E-mail notification is automatic and notifies Management staff if they are required to take action on an issue within the system. PRISM can accept inputs ranging from meeting minutes to complex audit reports, safety suggestions, hazard identification reports or full-blown accident reports. Where other systems offer modules to manage separate events (audit, flight crew report, ground staff report, cabin crew report etc.). PRISM provides Everett with everything in one package. The entire process of report handling is automated with minimal input. The system has a tested confidential reporting system that ensures Management are made aware of issues that may otherwise go unreported. Regardless of how many bases are in operation and where they are in the world, PRISM ensures that no report is ever lost. Reports entered into the system from bases will be instantly available to all Management wherever they are globally. Everett Management has total access to the system globally as long as they have an internet connection, thus ensuring that they are all kept fully up to date as to reports being filed around the entire business. The trend analysis tool built into the system has been proven to have prevented hazardous occurrences and saved significant cost through the identification of trends that would otherwise have gone un-noticed. Through the Bow-Tie Hazardous Events Management Process built into the software, Everett is able to demonstrate to regulators and auditors that we are managing the hazards facing our Company to an accepted level of risk. The trend analysis tool enables Everett Management to get a very clear picture of a very large number of trends, statistics, overviews, KPI's etc. from the system, thus making their management task significantly easier. Everett Aviation is pleased to be associated with PRISM Safety in our quest to become a world class operator with a highly respected quality and Safety Record.